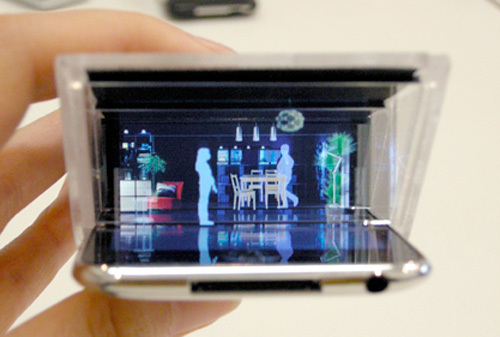 Using an old theatrical stage magic technique invented in the 1860′s by magician John Henry Pepper (Pepper’s Ghost) this Palm Top Theater accessory for your iPhone or iPod Touch lets you enjoy 3D content without the need for any kind of glasses. Well, kind of. You see it’s kind of a pseudo-3D effect that involves layering 3 different layers of video or animations using half-silvered mirrors at 45 degree angles. Without the accessory on your idevice the video being played back just looks like 3 separate animations stacked on top of each other. But when viewing it from the proper angle through the i3DG, the videos end up overlaid on each other, giving the illusion of depth. The i3DG was invented by a media artist named Jitsuro Mase, and while you can’t actually buy one, if you happen to be in town for the Rotterdam Film Festival early next year you will have the chance to check it out in person.